Young North Carolina life science companies need money. How’re we going to find what we need? 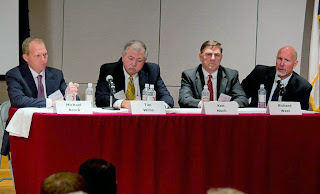 Funding and finance was discussed by panelists at the NCBIO annual meeting, including Michael Brock (left), managing director of Wells Fargo Securities; Tim Willis, president and CEO of Tear Science; Ken Moch, president and CEO of Chimerix; and Richard West, general manager of Advanced Liquid Logic, an Illumina Company. Photo courtesy of NCBIO. That’s been the head-scratcher for folks in the sector since we got enough companies to call it a sector. NCBiotech has been working on it for almost 30 years. We’ve put about $27 million into about 300 low-interest loans to help boost promising companies. That has often opened the door to follow-on funding, including angel and venture capital. But most of that kind of money changing goes on in the tech hubs that lead us – California and Massachusetts. Despite its ranking as third in the nation in the number of life science companies, North Carolina drops off the charts of venture capital companies. Don’t even talk about California start-ups’ occasional complaints that they don’t get enough attention if they’re not within a one-hour drive of the venture firms. In 2012, the National Institutes of Health pumped $3.475 billion into California, $2.562 billion into Massachusetts and $1.061 billion into North Carolina. Not too shabby. But when you look at follow-on money, the trail gets spooky. California companies scooped up $2.824 billion in VC funding in 2012, a ratio of NIH to VC of 1.2. Massachusetts firms landed $1.277 billion, an NIH to VC ratio of 2. Ridiculously, however, VC firms missed the boat by a ratio of eight to one in North Carolina during 2012. Despite the NIH putting respectable sums of money where good science is happening, North Carolina life science companies drew only $132 million in VC funding. What gives? Laziness? Ignorance? Elitism? Momentum? 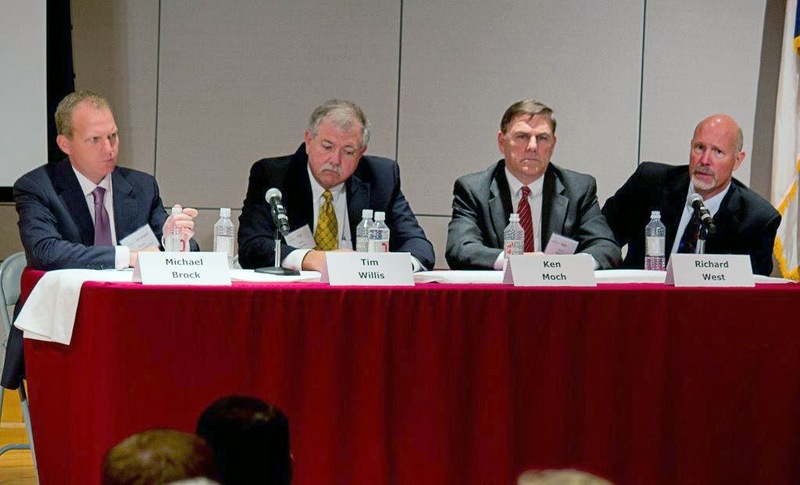 Money talk was front-and-center at two recent meetings at NCBiotech: the Oct. 18 annual meeting of NCBIO, and an Oct. 23 Biotech Forum on crowdfunding, co-sponsored by NCBiotech and CED. Entrepreneurs statewide are exploring every legal possibility for accessing the cash they need to pay the bills and move their technologies into the marketplace. And they say it’s getting tougher. NCBiotech tries to work every angle. Disease foundation funding is increasingly important, so we’re hosting some of the most cutting-edge forums in the world on the topic. We even got directly involved in air route problems, lending support that led to United Airlines’ non-stop service between Raleigh-Durham International and San Francisco. It’s not like having the investment houses in the Old North State, but it does represent a helpful cut in travel time between the Triangle and the money trough on the Left Coast. Something’s got to give – or at least, invest – if the state’s life science sector has a serious future in the increasingly competitive global marketplace, according to numerous attendees at the recent meetings. 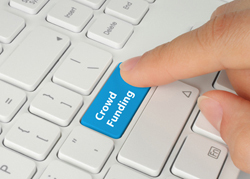 Crowdfunding might provide some help, if government restrictions are properly balanced. Adults buy lottery tickets, bet on sports and gamble in casinos. They can spend as much as they want. Chalk it up as entertainment. Wealthy adults -- "accredited investors" -- can also bet, via online crowdfunding, on life science startups in North Carolina and elsewhere, under federal rules approved by the Securities and Exchange Commission on September 23. But there are lots of strings attached to the 500-page federal guidelines. The nature of those strings will become clearer during the current 90-day public comment period. Historically this whole pocket of investment has been open only to those with deep pockets. Deep, as in people with a mil or so to toss around. The rules scream, “Only people with money are smart, and only smart people have money.” That’s clearly bogus, and crowdfunding is likely to let John and Jane Q Public get in on the risk of early access to relatively small chunks of new companies. N.C. Rep. Tom Murry, an attorney and pharmacist from Morrisville, has introduced a state crowdfunding measure packed into only 10 pages that could win approval in the upcoming short session. It would enable N.C. companies to raise twice as much per year via crowdfunding as the federal proposal, and open the door to heretofore "non-accredited" investors, meaning people of average means. One of NCBiotech’s portfolio companies, T3D Therapeutics, is entering a crowdfunding process with Poliwogg, one of the two leading crowdfunding firms presenting at the forum. The other firm, AgFunder, specializes in crowdfunding agriculture-related companies. I know of no N.C. ag companies starting a crowdfunding round with AgFunder yet. Would venture capital firms open new North Carolina offices if their first five or so investments in North Carolina-based life science companies could be free of state taxes? Could the North Carolina Biotechnology Center provide a year of free start-up office space to new venture firms setting up shop in the state? These and other ideas were floated among the cash-hungry life science entrepreneurs weighing the sector’s current health and future prospects. What are your suggestions? We need all the help we can get. Then we started organizing trips to the VC hubs for some of our venture-ready companies. The money mountains weren’t coming to RDU, so we decided to arrange for some of our most deserving companies to visit the mountains and pitch their wares .